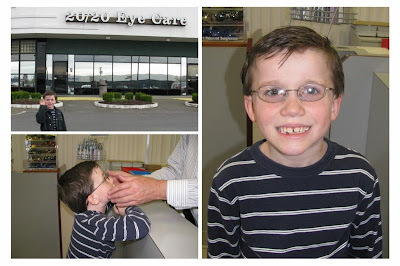 Last weekend we took the boys to the eye doctor. We thought Blake might need glasses. He didn't - Kevin did! He had 20/40 vision. Kevin was really excited to pick out his frames and we patiently waited over the weekend for them to be ready. I think the wait went a little easier yesterday while he got to spend the day with Blake over at Grandma and Grandpa's farm. We picked his glasses up late yesterday afternoon and we all love his new look. He's really happy about his new glasses! The drive home was fun as I listened to him talk about how good he could see signs along the way! Our "baby" looks so much older with his new glasses! I still think he's adorable though. He looks so handsome! It's great that he is excited to have them and to see "new" things. how adorable! lol. There always fun at first! aww how cute! I'm glad he can see better now! I'm supposed to wear glasses but I rarely do! Ohhhhhh he is too cute! He does look like a little man. He looks great with glasses! I know it made a huge difference this year for my older son! I love the glasses he picked out! So handsome.